2,300 year old harbor was the largest in the country during Hellenistic period and may have been military. A magnificent ancient harbor – considered the largest and most important in the Land of Israel in the Hellenistic period – has been unearthed in Akko (Acre). The harbor dates back 2,300 years, to the time in which the Second Temple stood in all of its magnificence in Jerusalem. Among the finds at the harbor are large mooring stones (photos 2 and 3 below) that were incorporated in the quay, which were used to secure sailing vessels. This was probably a military harbor. 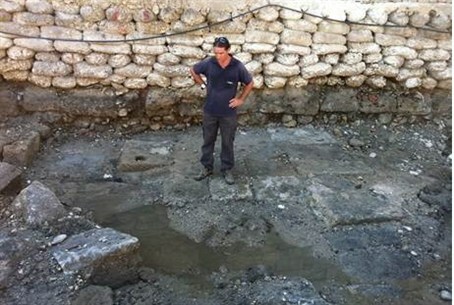 The Israel Antiquities Authority said in a press release Tuesday that in its excavations at the foot of Akko’s southern seawall, installations were exposed that belong to a harbor that was already operating in the city in the Hellenistic period (third-second centuries BCE) and was the most important port in the Land of Israel at that time. The finds were discovered during excavations that are part of the seawall conservation project undertaken by the Old Akko Development Company and underwritten by the Israel Lands Administration. The first evidence indicating the possible existence of this quay was found in 2009: a section of pavement made of large kurkar flagstones dressed in a technique reminiscent of the Phoenician style that is characteristic of installations found in marine environments. This pavement, which was discovered underwater, caused some archaeologists to speculate that it belonged to a quay, while others suggested this was the floor of a large building. According to Kobi Sharvit, director of the Marine Archaeology Unit of the Israel Antiquities Authority, “Among the finds we’ve discovered now are large mooring stones that were incorporated in the quay and were used to secure sailing vessels that anchored in the harbor about 2,300 years ago. This unique and important find finally provides an unequivocal answer to the question of whether we are dealing with port installations or the floor of a building." The dig also discovered a large mound of collapsed large dressed stones that apparently belonged to large buildings or installations, which was spread over a distance of dozens of meters. "What emerges from these finds is a clear picture of systematic and deliberate destruction of the port facilities that occurred in antiquity," says Sharvit. He adds, “Recently a find was uncovered that suggests we are excavating part of the military port of Akko. We are talking about an impressive section of stone pavement about 8 meters long by 5 meters wide that was partially exposed. The floor is delimited on both sides by two impressive stone walls that are also built in the Phoenician manner. It seems that the floor between the walls slopes slightly toward the south, and there was a small amount of stone collapse in its center. Presumably this is a slipway, an installation that was used for lifting boats onto the shore, probably warships in this case”. According to Sharvit, “Only further archaeological excavations will corroborate or invalidate this theory”. The bottom of the ancient harbor was exposed at the foot of the installations. There, the mooring stones were found, as well as thousands of fragments of pottery vessels, among which are dozens of intact vessels and metallic objects. The preliminary identification of the pottery vessels indicates that many of them come from islands in the Aegean Sea, including Knidos, Rhodes, Kos and others, as well as other port cities located along the Mediterranean coast. These finds constitute solid archaeological evidence regarding the location of the Hellenistic harbor and perhaps the military port. According to Sharvit, “It should be understood that until these excavations the location of this important harbor was not clear. Remains of it were found at the base of the Tower of Flies and in the region of the new marina in excavations conducted in the early 1980s by the late Dr. Elisha Linder and the late Professor Avner Raban. But now, for the first time, parts of the harbor are being discovered that are adjacent to the ancient shoreline and the Hellenistic city. Unfortunately, parts of the quay continue beneath the Ottoman city wall – parts that we will probably not be able to excavate in the future." Excavation will continue in those sections of the harbor that extend in the direction of the sea and the modern harbor, in an attempt to learn about the extent of the ancient harbor, and to try and clarify if there is a connection between the destruction in the harbor and the destruction wrought by Ptolemy in 312 BCE, the destruction caused by the Hasmonean uprising in 167 BCE, or by some other event..
Photo 1: A member of the Marine Archaeology Unit of the Israel Antiquities Authority standing on the ancient quay that was exposed in Akko. In the middle of the picture one can see the floor of the quay, built of large dressed stones. In some of the stones there is a hole for inserting a wooden pole – probably for mooring and/or dragging the boat. Photo 4: An imported bowl characteristic of the Hellenistic period. The bowl was found in a layer of harbor sludge. This layer contained thousands of intact pottery vessels and potsherds.